Who am I? And What value am I? Yep, for regular readers and friends – it’s a dip. I recognise it as such even though the sun is coming through the window. It’s not going to be allowed to have my whole day but to start with I am going to roll with it. When I was teaching I increasingly made it my business to connect and network especially as social media allowed links overseas as well as across the UK. I felt this enhanced my professionalism and the teaching and staff training / management that I did. Several of my senior managers questioned why I would bother – I am still convinced that I was correct and they were misinformed, but whatever. I developed networks for things that I was interested in – Solo Taxonomy practitioners; a news sharing geography connection. I enjoyed the late night edchats with colleagues in the Southern Hemisphere for example. Now my networking as I work at becoming an artist and one who earns some money from it means that I tend to connect on a more local scale. Yes there are still social media links and looking at each other’s online status / presence but much more connection is face to face and that is generally enjoyable. I think this morning is one of those transitional – what is my purpose soul searching moments. I have almost let go of the “teacher” label but getting ex pupils to not call me Sir or Mr Knill is harder. I feel that many education links now make little sense and just remind me I can’t cope with that anymore, it proved to be detrimental to my mental health. However, becoming an “artist” means baring my soul through my work, peoples reactions and so on. My hide is not always tough enough yet and I find myself being scared. Meanwhile at home I have gone from head stuck in work mode for 60+ hours per week to having time to relax, work etc. I am not good around the house as I don’t notice things that passed me by previously. Have a good day yourselves. 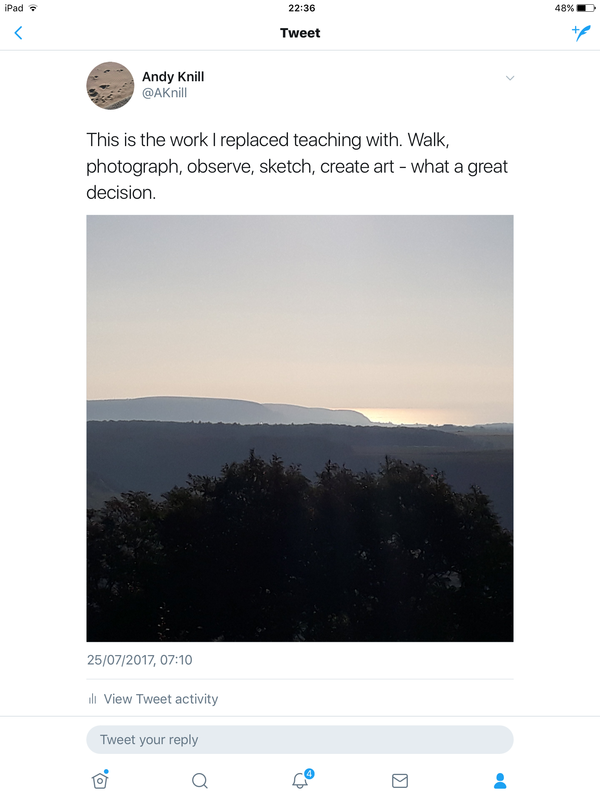 I went out for a walk in time for sunrise on Tuesday morning and posted this on social media afterwards as it sums up how I feel about my change of direction. I used to work for employers (schools). I still have one employer for my freelance part time job where there is structure and tasks that must be done but an opportunity to interact with customers. My main focus though is using my art to recuperate in periods of doubt, this week being one, and develop my work as an artist who sells. I am changing how I work, no longer am I ruled by timetables, bells, deadlines set externally. My life doesn’t have a daily timetable – it varies and this still suits, in the future I may need to timetable in art time but I am enjoying the flexibility for now. I see friends and ex colleagues starting their six week holiday – I don’t have holidays, it’s not a dads statement just what it is. I have two set work days (even these can change) and then five days to use in a variety of ways. I still rush around too much at times. In six months I have created an art vehicle (AndyKnillArt.com) that has seen me publically try and see if people like my work enough to part with their hard earned money. It was a big risk for me personally especially at a time when my mental health is still on a rollercoaster, although less steep drops now. I have responded to the Interaction of visitors, and buyers. I have discovered that through theee commission based events that the ensuing stress levels this is not an area for me to work on at this time at least, but I have been trusted to do this three times already with both photography and art. I have tried new texhniques and media, attended art group, met a range of other local artists, some of whom I would happily call friends now. I have settled in 11 months into a new setting and got to know many new people – I am home now here in Purbeck and I live my surroundings even on the wet and windy days.